This week, we stopped by the repair office at Powell, and technician Rachel Baker showed us something quite interesting. It was a flute with a curved line on the inside of the body tenon caused by an indentation on the outside. You will see it traced with a blue Sharpie marker in the photo below. 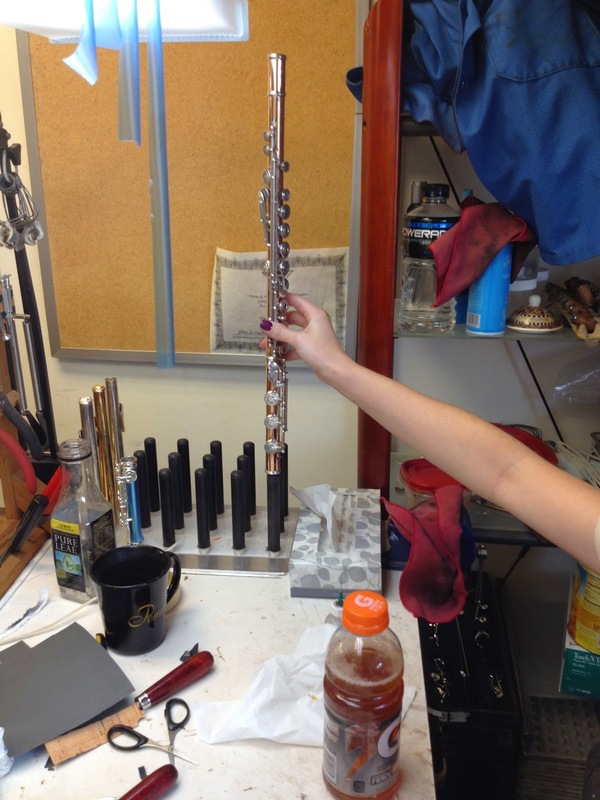 Oddly enough, the flute was sent to Rachel for regular maintenance, and the owner did not know about the indentation. What had happened was that she had been putting her flute on a flute stand at a bit of an angle. Since the flute was coming down on the peg at an angle, the outside ring on the top of the footjoint was pushing against the outside of the tenon. The pressure exerted on the outside of the tenon, in turn, created an indentation that left a visible line on the inside. So, although it may seem rudimentary to place your flute in a straight position on the stand, it could be something that is easy to overlook. The photos below will help demonstrate what to do -- and what not to do! Putting flute down on peg at an angle -- don't do this! Putting flute straight down on peg -- do this! Blue Sharpie mark shows the indentation.